What should I consider when buying an accessible vehicle from Kansas Truck Mobility? https://www.kansastruck.net/wp-content/uploads/2018/03/2017Hondawfamily2.jpg 250 750 kstadmin https://www.kansastruck.net/wp-content/uploads/2017/05/KsTruck_Horizontal_Slogan_Color_FA.png kstadmin2018-03-01 09:56:152018-03-14 14:34:58What should I consider when buying an accessible vehicle from Kansas Truck Mobility? There are many decisions to be made when determining accessible transportation. We’ve discussed side entry vs. rear entry as well as adaptive seating. Is there a difference between adaptive & accessible vehicles? Also known as adapted vehicles, these are vehicles that modified to allow for operation of a vehicle by a person with limited mobility. The industry’s terminology can be confusing. Adaptive vehicles may also refer to a converted vehicle or one that has been re-manufactured for highway safety and full independent access for entering/exiting the vehicle in the wheelchair independently. https://www.kansastruck.net/wp-content/uploads/2017/11/Adaptive-vs-Accessible.jpg 250 750 kstadmin https://www.kansastruck.net/wp-content/uploads/2017/05/KsTruck_Horizontal_Slogan_Color_FA.png kstadmin2017-11-07 15:17:492018-03-14 12:36:46Is there a difference between adaptive & accessible vehicles? 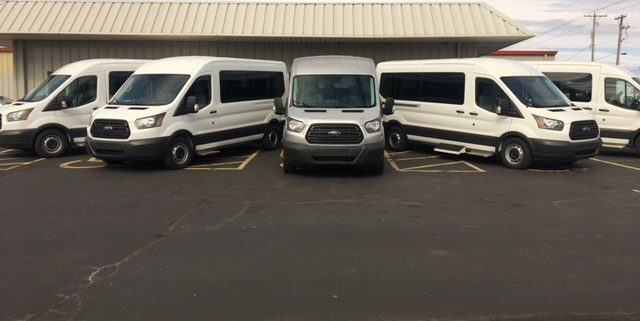 If you are considering upgrading transportation options for 2018, The Ford Transit Wagon XL 350 is available at Kansas Truck Equipment. Kansas Truck Mobility is a provider of transportation solutions for people with disabilities and we pride ourselves in working closely with every customer’s unique needs to provide a mobility solution that works best, especially when it comes to transportation to and from work. This is relevant today because October is National Disability Employment Awareness Month (NDEAM). We see many people searching for turning automotive seating, and previously we wrote about Bruno Stow-Away seating for pickups, as well as side vs. rear entry options. However, you might be looking for a passenger entry option that combines the convenience of side or rear entry with the minimal impact of stow away seating. Bruno offers the Bruno Valet Plus, the most versatile of the Valet Signature Seating line. In our previous articles, we discussed the expansion of options for mobility vehicles in recent years , as well as which entry option is suitable, rear or side entry. Today, we are going to discuss lift options that apply to pickup trucks, which have not always been the best option for mobility, but products like stow-away packages allow for easy entry into a truck without affecting the interior of the cab.